The eye-catching, 5,415-square foot Colonial at 2493 Redding Road in Fairfield is roughly 200 years old, having been built in 1817. As such, it has many antique details, including its arched doorways, antique moldings and stone fireplaces. But it also has modern functionality, and wide-open spaces. The home also has such features as a windowed, three-season porch, a gazebo, pool and a barn, that dates to the 1980s but was built with reclaimed antique wood. 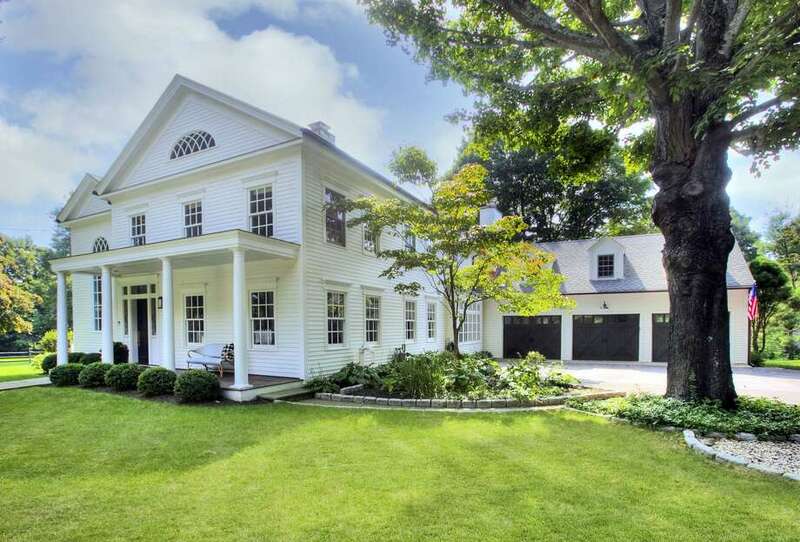 FAIRFIELD — The house at 2493 Redding Road sits on a sweeping 3.6-acre piece of property. It’s large enough for a gazebo, a pool and a three-stall, two-story barn. It’s also big enough for special occasions. Like a wedding. “The family that lived here got married in the backyard,” explained the property’s listing agent, Kate Cacciatore. The house, listed at $1,299,000, has expansive, high-ceiling rooms full of windows and natural light — great for entertaining, Cacciatore said. And the most recent owners loved using it for that purpose, she said, hosting not just their nuptials there, but many parties through the years. Its spaciousness is all the more remarkable, given that the home is an antique. Built in 1817, according to town records, the house still has some of its original design features, including the arched doorways, a vintage staircase and antique moldings in some areas of the interior. It has been renovated over time, and its large rooms give it a “great modern functionality” that isn’t typical of antiques, Cacciatore said. Touches that have been added over the years include a heated, window-encased three-season porch that overlooks the estate. One feature of the home that doesn’t date back two centuries — but looks as though it could — is the aforementioned barn. Stationed deep in the property, the structure was built around 1980, Cacciatore said, but was made with reclaimed antique wood, making it look much older than it actually is. With electricity and tons of space, the barn can, and has been, used to house animals. Two stalls still have the names of their former residents — Cookie and Seabreeze — posted outside. But Cacciatore said it has other uses as well. The current owners, for example, used it for storage. However, she said, with the right care and renovations, it could be turned into an impressive party barn for entertaining. The house itself has an impressive 13 rooms, including five bedrooms and five and a half bathrooms. There’s a huge master suite with a bay-windowed sitting room and a walk-in closet almost big enough to get lost in. There’s also a separate in-law apartment over the garage that features its own bedroom, full bath and kitchen. Outdoor features include two bluestone patios, suited for al fresco recreation or entertaining, and the free-form gunite pool, with a waterfall and cabana. Cacciatore said the home’s rustic feel joins together with its more modern features to shape it into something special. “It really is just a gorgeous antique,” she said.